The novel opens with nine-year-old Madeleine Altimari holed up in her room smoking a cigarette and shimmying to jazz music at 7 A.M. Madeleine's dream is to sing onstage like her late mother, but her hopes were dashed at last year's school Christmas concert after her performance caused a ruckus. On Christmas Eve Eve, Madeleine faces a series of unfortunate events that eventually land her at the Cat's Pajamas jazz club at 2 A.M.
A teacher at Madeleine's school, Sarina is newly divorced and continues to pine over a man she once knew in high school named Ben. On the morning of Christmas Eve Eve, Sarina is invited to a holiday dinner party by a high school friend who informs her Ben will also be attending. Taking great care with her appearance and composure, Sarina attends the party with hopes of rekindling lost love with Ben. The Cat's Pajamas has been in Lorca's family for close to a century. Unfortunately, jazz music is no longer appreciated and coveted by newer generations, and Lorca's club faces permanent closure due to a number of violations. On Chrismas Eve Eve, Lorca makes plans to save his club, but little does he know that the impending night ahead could be one of the jazz club's most memorable nights in recent history. 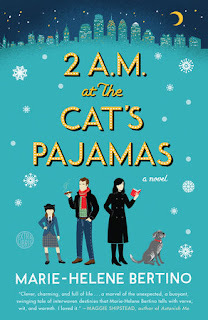 I wasn't quite sure what to think about 2 A.M. at the Cat's Pajamas while reading the first chapter. I initially thought the story might be too quirky and nonsensical to follow, but changed my mind when I got to the second chapter. That's when I fell in love with this novel. Each chapter is labeled with the time of day, and begins at 7 A.M. on the morning of Christmas Eve Eve. While the novel does focus mostly on Madeleine, Sarina, and Lorca, there are brief chapters thrown in here and there about supporting characters, including a dog named Pedro. Each character in the novel is linked to another in some form, which makes the story come together perfectly in a unique, satisfying way. Relating to all the characters in this novel is cake. You can't help but yearn for Madeleine to showcase her singing talents onstage, you'll be rooting for Sarina and Ben to have a happy ending, and you'll want Lorca to accept his musically talented son and either maintain his jazz club or move on. The novel glides along quite happily but triggers slight disappointment when it finally ends, but only because I could easily have devoured another 50 pages or so. Perhaps the novel is perfect as it is. All in all, I loved it. The structure of the story reminds me of those holiday movies of the Garry Marshall variety that always seem to feature a large cast of stars, such as Valentine's Day (2010) and New Year's Eve (2011). If you're looking for a fun, light holiday read, 2 A.M. at the Cat's Pajamas is definitely the right choice!